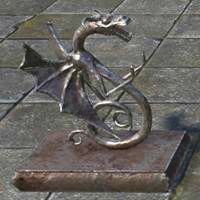 Figurine, the Sea-Monster's Surprise is a housing decoration made by Jewelry Crafter in The Elder Scrolls Online. Crafted, Jewelry Crafting Station. Requires Sketch: Figurine, the Sea-Monster's Surprise. Sketches are found randomly in containers around tamriel, and can be traded and sold by players. Some special sketches are only availble from pickpocketing or as special rewards. The mats listed are incorrect. It&apos;s extremely misleading, as the 2 x Zircon Platings are, currently, about 200x the cost of 3 Rekutas! Thanks for this - it&apos;s extremely misleading, as the 2 x Zircon Platings are, currently, about 200x the cost of 3 Rekutas! I believe this applies to the other two JC figurines, too. Material needed are incorrect / out of date. It uses 2 zircon plating instead of 3 rekuta.